My contribution to the 2015 Werewolf Calendar! Check out their website: www.werewolfcalendar.com/ or their group here on DA to see the amazing work by the other artists from this and previous years. Pre-orders open September 1st on their website! When I was assigned summer as my theme season I couldn't resist painting a werewolf seeking relief from the heat in a secluded stream. Who can blame him with that fur coat? I know I cant resist the water during the summer. Sorry about being dead lately here, there should hopefully be more art on the way soon! Fabulous light and motion captured here. Absolutely amazing work! Really lovin' the level of detail in this! Great facial expression as well! too real! CANT HANDLE THE HD!!!! Amazing and beautiful job!!! Very detailed too!!! Heh, heh... that's rather adorable actually! Love the colour and detail there too! Wow that is incredible! What talent you have, it deserves more attention! Wow that fur is amazing and I love how you have frozen the motion of the water so well, fantastic piece! How amasing! What the beautiful drawing! Wjat thr fur! Just wouderfull water! The movement in this painting is so natural and playful. ^_^ And the look on the wolf's face...absolutely adorable! AWWW, SO CUTE!!! I love how it winks, it's really adorable! 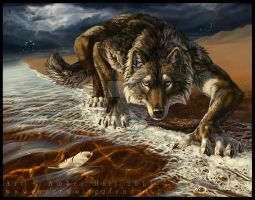 One little thing, the fur looks dry, if the wolf is shaking water from it's fur, then shouldn't the fur be wet? Even after a good shake the fur isn't dry, just saying, otherwise it looks great. Ahhhhh, THIS IS AMAZING! I love this!